SNLUG1.5ORANGE Orange medium (2-7/8") Each pack comes with 4 individual lug nuts with the StanceNation logo laser etched on each piece. Note: For a full set, please make sure 4 or 5 packs are purchased (depending on your car). SNLUG1.5PURPLE Purple medium (2-7/8") Each pack comes with 4 individual lug nuts with the StanceNation logo laser etched on each piece. Note: For a full set, please make sure 4 or 5 packs are purchased (depending on your car). SNLUG1.5GREEN Green medium (2-7/8") Each pack comes with 4 individual lug nuts with the StanceNation logo laser etched on each piece. Note: For a full set, please make sure 4 or 5 packs are purchased (depending on your car). SNLUG1.5PINK Pink medium (2-7/8") Each pack comes with 4 individual lug nuts with the StanceNation logo laser etched on each piece. Note: For a full set, please make sure 4 or 5 packs are purchased (depending on your car). 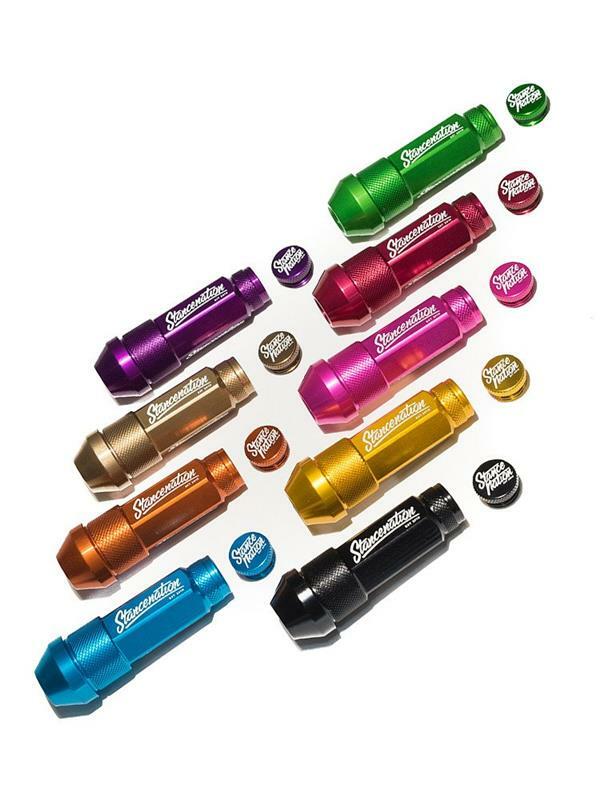 StanceNation Lug Nuts are made with lightweight aluminum with 3 different length options: small (2”), medium (2-7/8”), and large (3-5/8”). Each pack comes with 4 individual lug nuts with the StanceNation logo laser etched on each piece. The use of an impact wrench could result in scratches on the lug nuts and is not recommended. Please make sure to torque the lug nuts according to the manufacturer’s suggestion. Note: For a full set, please make sure 4 or 5 packs are purchased (depending on your car).